A dark heart. A pure soul. A love that will last forever. 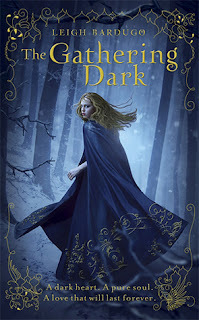 I received The Gathering Dark by Leigh Bardugo from Indigo for review, which I absolutely LOVED reading! My favourite characters were Alina and Mal. Inseparable since they became childhood friends at the orphanage, Alina and Mal start to slowly grow apart. Mal befriends others of the same status as himself within the Army, whilst Alina in turn, makes a few friends of her own as well as becoming more independent, in her position as cartographer’s assistant. Alina was one of my favourite characters because despite her small stature, she is quite fiery, stubborn and determined. Mal was one of my favourite characters because of his amazing hunting and tracking abilities as well as his caring nature. I absolutely LOVED reading about the fashion in Ravka! The descriptions of not only the surrounding landscapes and residents of Ravka, but also the fashions of each class were amazing! I also really liked reading about the Grisha culture alongside Alina, as she learnt about it herself. Although I like the cover of The Gathering Dark, I prefer the cover of my ARC copy due to its simple, floral patterns and bold colour scheme of purple, black & white. The world sounds fasinating and so do Alina and Mal. I agree the flowers really pop on the Arc. Awesome review!